Things have been a little busy the last few months- which for me should be expected- but I still manage to get swept up in a wave of my obligations and overwhelmed with self-imposed expectations. That being said, I have started over 6 different blog posts since the last one and never made time to finish them- but nothing motivates me like a good story. So here it goes. Lately, Dan and I have been on different schedules. I am working the during the day and early evening and he is working the evening into the late night- so it is not uncommon for him to slip into the house under the cover of night. Last week would be somewhat of an exception. Needless to say there was a little post-work indulgence one night after work that blurred into the wee hours of morning. I woke around 5:45 am to the sounds of a Dan finding his way to the guest room in a touch-and-go fashion. I considered getting up to check-in but it was frigid in the house and my aversion to the cold inspired me to leave him to his own devices. About an hour and half later I woke up to the dogs tap-dancing around the bedroom with more enthusiasm than usual. As soon as I let them out, they ran to the guest room door and demanded to be let in. I will admit, I initially assumed they just desperately missed Dan, until I opened the door and they flew to the back of the room. At this point I left them to their own devices and headed to the kitchen for tea when I discovered the back door wide open. Before I could think too much about it, I heard Foxy in the front room going bananas (while Dan slept soundly). We have had a lone rat or two make itself at home in the house and I always highly encourage the dogs to hunt them to the death. During these chases, Foxy makes a very unique whine/giddy/freaked out noise that was at that moment escaping her, so I decided to figure out the cause. As quietly as possible, I started moving a filing cabinet, boxes, and wires while the dogs became increasingly beside themselves. As soon as an opening presented itself, Foxy dove into the back corner and before I could react, a small furry rodent flew at my head and onto the curtains (cue startled screaming and dog barking). The trapped critter was flaying around in the curtains trying to escape when I realized we did not have a rat on our hands after-all. I know what you are thinking- this is the point where Dan shot out of bed, charged to my rescue and removed the wild beast. But you are seriously underestimating his ability to sleep through anything. Literally. So meanwhile I have to drag the dogs, frothing at the mouth with sheer delight at our captive squirrel, and lock them out of the room. I emptied a box and tried to corner the little guy using a broom but this elicited a glorious chase that included an attempt to escape up our blocked chimney, a rousing tour of Dan’s closet, and an excursion through a chest of drawers. 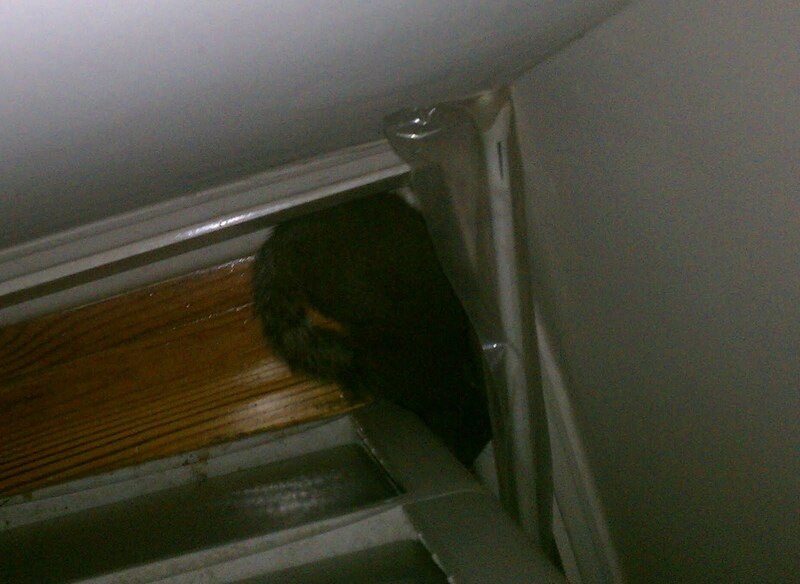 Meanwhile, Foxy has managed to wedge a surprisingly significant portion of her head under the door to watch. After a good chase, the squirrel and I found ourselves in a stand-off with our eyes locked as he perched onto of an oscillating fan and I promised him “I want you out as much as you want to be out- I will not hurt you” but he was not buying what I was selling. After 30 or more minutes he eventually barricaded himself in a corner as seen in the picture. Finally I popped one of our window screens out, created a barricade, and proceeded to wait the little guy out. The minute he showed his face, I went full broom on him and he flew through the air, out the window, and landed about 15 feet below on the sidewalk. He darted straight into traffic while I screamed “NOOOOOO” for fear that after all of my efforts he would end up as the exclamation point on a skid-mark. Yet my uninvited house guest managed to make his way into a tree and off to safety while chattering a stream of running commentary- which no doubt was about the crazy banchee and her two canine henchmen living in the house. Needless to say, I was a little late to work, but thankfully my boss accepted my “Late Due to Squirrel” excuse. In the end, Dan slept through the whole thing.